It has been interesting to read about your struggles with Toby and Kelly being aggressive with each other. I currently have five budgies, two females (Esther and Daisy) and three males (Wally, Ripley, and Beaker). Although the females are not fond of each other, they live fairly peacefully together. Also, our male budgies Wally and Ripley have become very bonded with each other. However, Wally and Beaker, who had been living together fairly well for many months suddenly began to exhibit extremely violent behavior toward each other back in February. So much so that we had to move Beaker into a cage ‘next door’ and for about 4 months, Wally and Beaker could not be out of their cages together without a death match occurring. Then in late May things started to calm down and now Beaker spends a few hours each day, supervised, with full access to the main cage. He still stays next door while we are at work and he prefers to sleep in his own cage. Things are fairly harmonious, though Wally and Beaker still bicker quite a bit. So I guess I’m saying that things change and it’s hard to predict if specific birds will get along and how that might change over time. 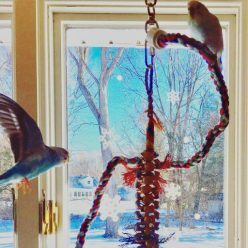 Regarding adding another bird to the mix, we have introduced one or more new birds to our flock four times now and our hopes and predictions for how that would go were pretty much dead wrong every time. 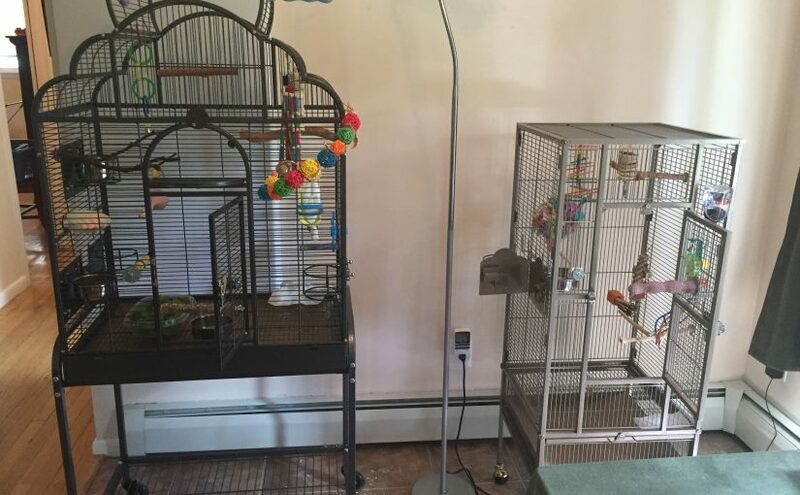 Don’t get me wrong, I’m happy that we have all 5 of our budgies (4 are rescues or rehomes), but we have had to make accommodations each time we adopted that we didn’t plan for. The bonding we predicted did not happen as planned and there were new and unanticipated social dynamics each time. But all in all, you can tell that for them it’s ‘the more the merrier’ even though that means both happy and mad interactions. I’m looking forward to reading more about the changes in Toby and Kelly’s relationship and to see how things go for you if you add another bird to your flock. Hi Angie! Thanks very much for taking the time to share a bit of the story of your flock with me! I’m sorry that your Wally and Beaker suddenly turned so violent towards each other, it’s a really great illustration of how things change and shift in the flock and that parakeets who are engaged in a death match today might be pals again down the line, or at least be able to ignore each other! I’m happy to see that although adding parakeets has never gone as predicted you still feel like more budgies to a flock is an overall positive experience for them. I can definitely imagine how my thinking that Kelly needs someone to bond with could turn into adopting someone who bonds with Toby!